I’ve heard The Triplets of Belleville described as “odd” and “charming.” I wouldn’t call it “odd” so much as “different,” and “charming” doesn’t quite nail it so much as “entrancing” does. It defies many conventions of modern animation, especially in the Age of Disney. You won’t be able to tear your eyes off of it. If you want to try something original, then here are five reasons why you should give The Triplets of Belleville a shot this weekend. I spent a ton of time with my grandparents as a child. As such, I was immersed in music, literature and film that most other kids didn’t get to their hands on until they became college students. 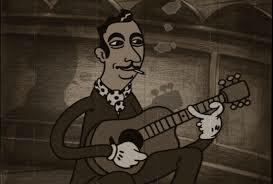 So when I saw Django Reinhardt and Josephine Baker animated, I knew exactly who they were and felt like I was looking at old friends. If you’re like me and grew up with the greats, you’ll get this feeling when you watch it too. They even got the fingers right! YUUUUUUUUUUUUUUUH! This is not a film filled with beauty queens and fairy princesses. 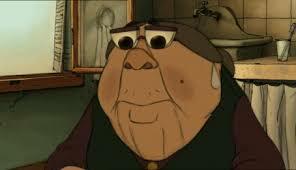 We have an older woman with a mole, glasses that magnify her eyes, and a special shoe to offset her shorter leg. There are characters with buck teeth, hook noses and bald spots. There’s off-screen violence, mobsters and little touches like butcher shops and unsavory meals. There’s a realness to it that most live-action films lack, let alone animated fare. It’s nice for once to see a film featuring characters that look like (gasp) real people you’d find hanging around your everyday life. This is a face I’d have hot chocolate with. A silent movie may seem out-there, especially when we live in the world of wordy Woody Allen and Quentin Tarantino films (author’s note: Tarantino’s cool, but Allen can eat a bag of dicks). However, this film is so good that it doesn’t need talking. You’re interested in it without really caring about who’sg got the best lines. That’s a nice trick, and worth the watch by itself. Did I say “a little”? I meant a lot. I won’t spoil why Champion the cyclist is kidnapped. It’s too off-the-wall for you to experience it other than letting it unfold first-hand. What I will say is that there are several points in the moments after they happen where you wrinkle your brow and say, “Wait, did that just happen?” Yes. Yes it did. And it’s great. Yes, that’s a bazooka. It figures into the plot. This is a story about a grandmother that tries to make her grandson’s life better. Whether it’s helping him pursue his dreams or rescuing him from harm, she’s there for him no matter what. There are no melodramatic proclamations on her part: she’s very factual in her approach. Most people are lucky enough to have that rock in life that’s just there. No matter if it’s a grandmother, father, cousin or sibling – if you’re lucky enough to have that person that does not need to be asked to help, but just steps up and does it, you will appreciate this film. Sound off in the comments below and let me know what you think.